By the turn of the twentieth century, many of Manitoba's small urban centres had grown into solid, prosperous communities. Their buildings reflected this evolution. 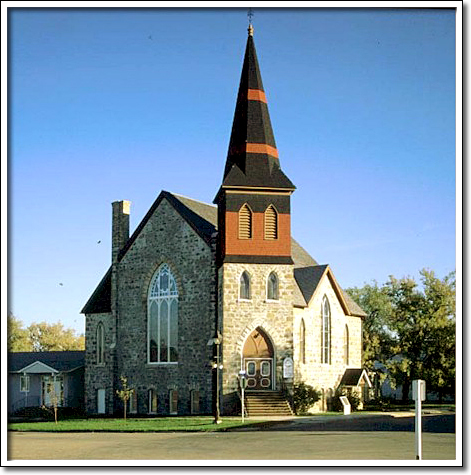 Substantial Presbyterian and Methodist churches of brick and stone eventually came to replace earlier wood-frame structures. St. Paul's United, originally Methodist, is a fine example of these large buildings. Built in 1893, it is one of the foremost representatives of fieldstone construction. The church exemplifies the Gothic Revival style, one of the most commonly used architectural expressions of the age. Edward Lowry, a Winnipeg architect, prepared the design for the building. The stone, lime, and sand used to build the walls were drawn from local sources. The construction was undertaken by volunteers from the congregation.